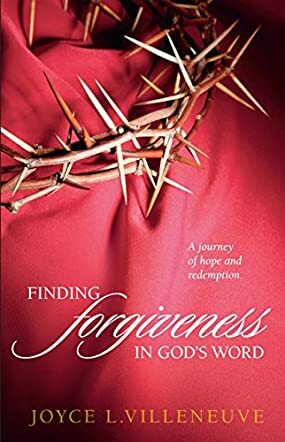 Finding Forgiveness In God's Word by Joyce L. Villeneuve is a wonderful book explaining how one can move past the areas of unforgiveness into areas of hope and peace. This book deals with the all important question, "How do I forgive myself?" This is the very basic foundation that one must explore to be able to move forward. Joyce takes the reader into a period of self-examination so one can truly understand who they are in Christ Jesus and how through His forgiveness one can forgive themselves. Next, there is a chapter on "How Can I Forgive Others?" Forgiving oneself isn't enough to truly be at peace, but we must learn how to forgive others and what they have done against us. When we live with the bitterness attached to this unforgiveness, it truly stops us from enjoying life as Christ desires for us to live. Thirdly, the author deals with "How Can God Forgive Me?" This question is one that every person seems to struggle with and the author does a great job of explaining how we can accept this forgiveness that is afforded to each of us through Christ Jesus. Finally, there is the discussion of "What Is Forgiveness? The Steps To Forgiveness and Have I Truly Forgiven?" These steps are vital for every believer. Christ desires for us to live a life of freedom, but we can't arrive at that level until we experience His forgiveness and learn how to forgive others. Finding Forgiveness In God's Word gives the reader a very practical way to explore this subject with scriptures, examples, questions and closes the book with a "Forgiveness Prayer." If you or someone you know hasn't learned how to accept God's forgiveness for what they have done, then this is the book to read. If unforgiveness of what someone has done to you is still haunting you, then you will be able to find a release through this author's strategic outline and direction. This is a book that counselors should use to help people move forward in life and let go of the things that are holding them captive.